Great! Next phase should definitely be to aim for liquid enough single stock contracts so you can actually trade stuff like dispersion/correlation. 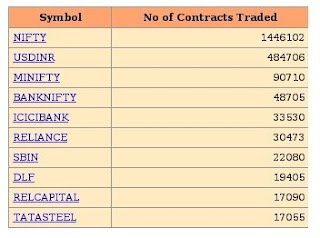 <50,000 contracts for a few single names (out of 50) vs ~£1.5m on Nifty looks quite wide. But good news. What do you mean by asymmetric information? I fully agree with your '97 article, but it has no mention of this. The single stock contracts are extremely liquid and this kind of stuff is feasible right away. Asymmetric information is the foundation of the way the microstructure literature thinks of the bid-offer spread. If I know something that you don't, then on average, you're going to lose money in trades against me. At equilibrium I know how bad the situation is on asymmetric information. So I protect myself by quoting wider bid-offer spreads. The huge volume of trade in NIFTY Futures may also be due to the interest of foreign institutions in the Indian market. In a recent CFA conference, I spoke to a fund manager from a Dutch pension fund. He told me that the pension fund trades mostly in NIFTY futures. One of the reason is the correlation of the index with the Indian macro and the second is liquidity.He also told that the trading of NIFTY in the Singapore Stock exchange also helps them to take exposure in the Indian equity market.